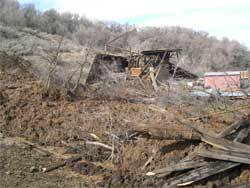 View looking down the landslide; the remainder of the demolished barn is at left and part of the barn roof lies farther downslope on the landslide toe. 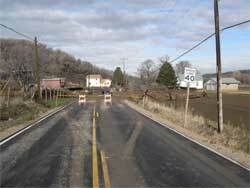 The landslide debris was removed from State Route 60. 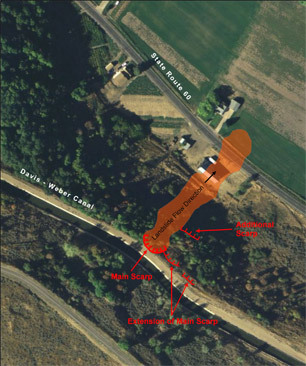 On the evening of February 20, 2005, a landslide in South Weber flowed across South Weber Drive (State Route 60) at 425 East, blocking State Route 60. The highway was subsequently closed and cleaned up by the Utah Department of Transportation. 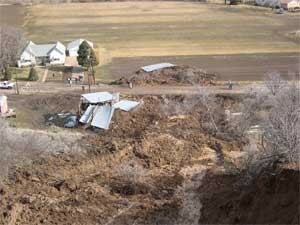 The landslide destroyed a barn south of the highway, and flowed into a field north of the highway. 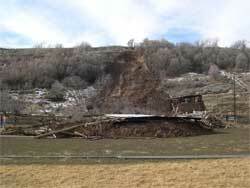 The landslide was about 480 feet long and 80 feet wide. The landslide is just below the Davis-Weber Canal and likely started moving as a rotational slide in the canal embankment, but quickly transformed into a rapid earthflow about midway downslope and ran out 150 feet beyond the toe of the slope. The landslide occurred in one of the steeper parts of a north-facing slope underlain by a prehistoric landslide that has been locally historically active. The geologic material in the slope under the canal embankment is sand, silt, and clay of the Pleistocene Lake Bonneville Weber River delta. The slope formed as the Weber River cut down into its former delta as Lake Bonneville receded 16,000 years ago and the shoreline retreated to the present level of Great Salt Lake. 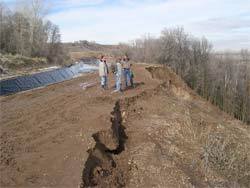 Shallow ground water and weak soil materials characterize the slope. The main scarp of the landslide is in the outer canal and canal road embankment. The upper part of the main scarp is composed of canal embankment fill, and about 20-25 feet of the embankment and canal road remains between the crown of the landslide and the canal. Water is not presently flowing in the canal, and it was undamaged, but the canal is threatened by eventual retreat of the main scarp. Fresh scarps in the hillside in and just below the embankment are found both east and west of the landslide, indicating that adjacent slopes remain marginally stable. At the time of the UGS investigation on the morning of February 21, water was flowing from the landslide scar below the main scarp about midway down the slide. The vegetation types indicate that shallow ground water was present in the hillside adjacent to the landslide, particularly to the east. Records from the National Weather Service stations indicate the Layton-South Weber-Ogden area received 148% of normal precipitation for the period since September 1, 2004 prior to the landslide. In addition, the area received greater than normal precipitation last year, and an additional 0.72 inches of rain fell on the day of the landslide. Shallow ground-water conditions, along with the steepness of the slope (up to 65% locally), presence of the canal embankment fill, and underlying weak geologic materials in the slope probably all contributed to the landslide. This report is preliminary and subject to revision; it is presented here to facilitate a timely release of pertinent information.